We strongly recommend that you prepare for the test and do some practice before you submit an application for the IELTS: if you do not know how the Test is done, your score will be lower, probably a lot lower! You can apply for the IELTS at any IELTS Test Centre. You can check the address of your nearest Test Centre by going to the IELTS Web siteThe IELTS site will open in a new window.. Call or email the Centre and ask for an Application Form. The Form will have details of when you can sit for the test, where you have to go, how much it will cost and how you can pay, but you may want to ask about this when you call or email them. When you turn up to sit for the test, you will need to bring identification. You will be advised exactly what kind of indentification is required. When do I receive the results of my IELTS Test? 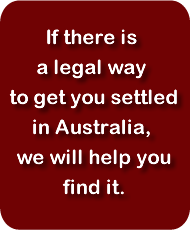 You will usually receive the results within two weeks of the date of your test. What do the results look like? What do I receive? Irrespective of how well you do in the test, you will receive an IELTS Test Report Form with details of your scores, the date of the test and the IELTS Centre where you took the test. 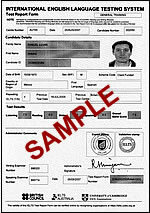 Every Report Form has a unique ID, which is used by the Department of Immigration (and others such as Universities) to check and verify your results. How long must I wait to take the IELTS Test again? If you don't get a high enough score and have to take the IELTS Test again, you must wait at least three months. However, you can take the test as many times as you like - there is no limit on the number of times you can sit for the IELTS. How long is my score on the IELTS Test valid? The Department of Immigration (DIAC) accepts the results of IELTS Tests taken in the 24 months (2 years) before the date you lodge your visa application.